Who is your Appointed First Aider? Did you know that 8 out of 10 UK businesses are still not compliant with the current First Aid at Work regulations? When was the last time any refresher training was carried out, whether this was in the areas of First Aid or Health & Safety? Training your staff in these areas is essential when it comes to First Aid compliance. Without the correct training, should an incident occur, as a business you could face hefty fines and even prosecution. HSE recommends that First Aiders have annual refresher training because “skill fade” can occur very quickly after a course has been completed. It is important to check whether your nominated First Aider has a current and up-to-date certificate. All First Aid training qualifications are only valid for 3 years, whether they are accredited or locally produced. Regardless of the legal implications, as an employer, isn’t it better to have peace of mind that your employees are safe and able to deal with any accidents should the worst happen? Did you know that most injuries at work are slips, trips and falls? 18% of non-fatal injuries at work were from slips, trips and falls on the same floor level. 20% of injuries were sustained while carrying or lifting. There has been a 41% rise in injuries in small businesses in the last 5 years, despite a drop in 2016. What workplace checks should you be making? Typically, most businesses, shops and hotels have a list of faults; many of which may have been picked up over long breaks where there has been more time to review and assess. Any faults or problems that have not been repaired – from leaks to damaged stairs – can result in serious injuries to your employees. Never put off any risk assessments or repairs when it comes to running a business, as you could pay a heavy price in the long run. Check your First Aid kits – are they complete? Are all items in-date? Is the First Aid kit sufficient for the types of injuries you may encounter in your workplace environment? Automated External Defibrillators (AED) – do you have one on your premises? This important piece of lifesaving equipment is increasingly being fitted in the workplace. If you do have AEDs, how regularly are they checked? When are the pads or battery due to expire? One recent case highlighted where an AED was going to be used, but the battery did not have enough charge to deliver a sustained level of shocks. Tragically, the individual died, and we will never know whether they could have been saved had the equipment worked properly. If you manage a hotel, pub, bar, social club or youth centre, do you know the correct process for dealing with blood spill, urine or vomit? There are strict regulations on how to deal with bodily fluids. Sharps and needle disposal – do you know how to dispose of these items correctly? If you have any employees with diabetes or other medical conditions, then it’s vital you have the correct facilities available for sharps and needle disposal, i.e. sharps bins. Visits from the HSE can be both costly and lengthy, especially if you need to attend court. 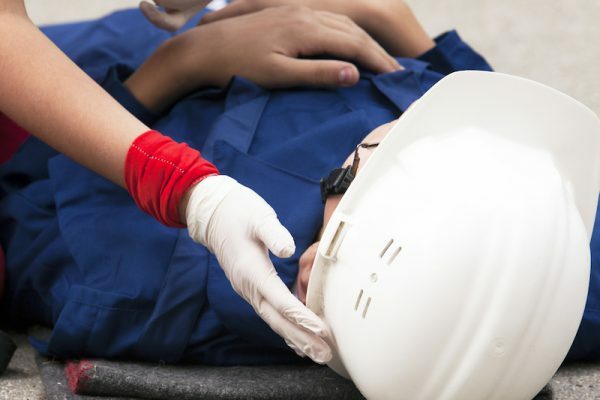 As well as the loss of staff due to having to take time off, if you fall short on your First Aid obligations, you could be facing large financial losses in terms of compensation payments or the cost of hiring temporary staff. Add to this the bad publicity you will receive on social media, and you can see why it is essential to ensure you are fully compliant when it comes to First Aid in the workplace and any Health & Safety requirements. LWS Training services, provide a wide range of First Aid and Health & Safety courses to keep you covered, both legally and from a safety perspective. Our training sessions are practical and hands-on to ensure your staff know exactly what to do in an emergency situation. Stay safe and stay legal!